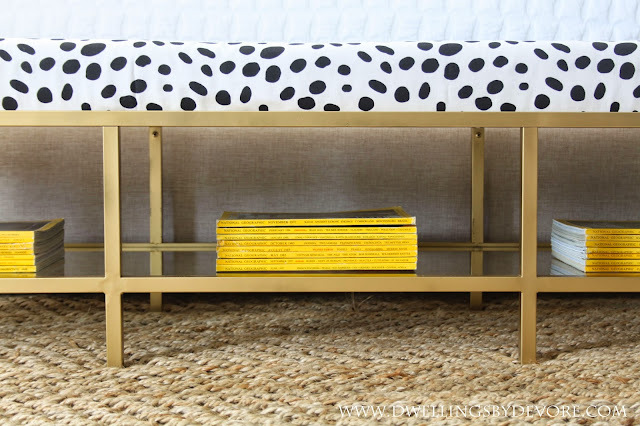 One of my favorite elements from our master bedroom room makeover is this bench. I wanted something with a metal base, preferably gold, but couldn't find anything that didn't cost a pretty penny. I also needed it to be fairly long so it wouldn't look disproportional when placed at the foot of our king size bed. I searched all my usual places (Craigslist, thrift stores, Goodwill), but came up empty handed. Then, I happened to be at IKEA and checked the "as is" section. You just never know what you'll find in there! 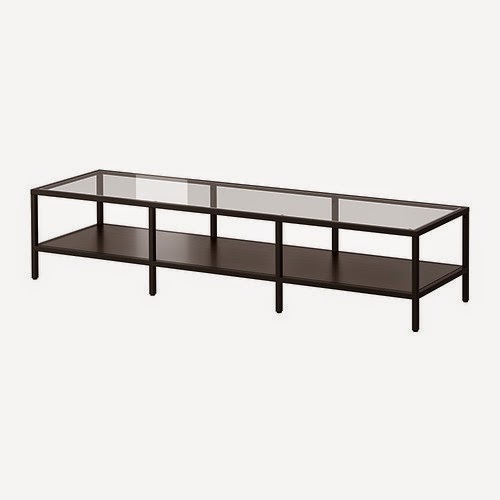 I saw this IKEA vittsjo TV unit and my first thought was, that would make a great bench! The lines were perfect, the size was spot on, and the shape was exactly what I was looking for. It was already put together which is a nice bonus when it comes to IKEA furniture. And the price was great too. The only drawback was that the top was glass and the bottom shelf was solid. I needed it to be the other way around so I could upholster the top. That was an easy fix though. I just removed the felt pads from the metal tabs on the top that were holding the glass in place and put the felt pads over the holes in the tabs on the bottom supports. 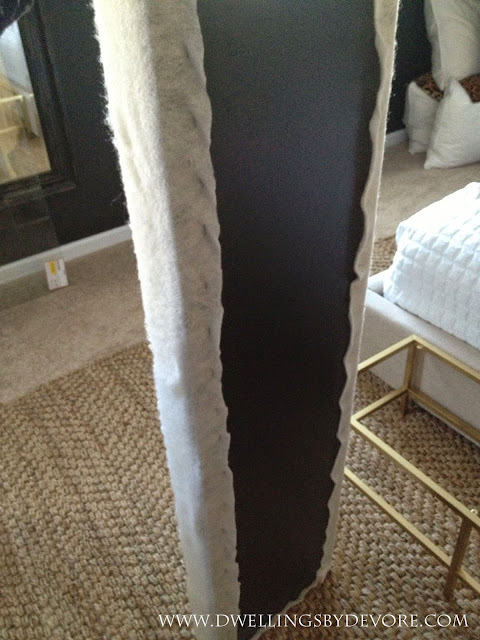 Then I drilled holes in the tabs on the top portion so I could screw the wood piece into place after I upholstered it. Next, I painted the the metal base with Rustoleum Gold Metallic spray paint. The glass and the solid piece are the same size so you can easily interchange them. I could have just switched them and had a bench with a solid top, but I wanted something upholstered. 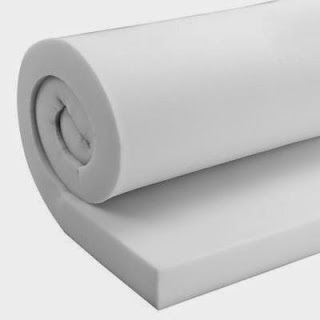 I didn't want to spend a fortune on foam so I bought this mulit purpose foam pad from home depot. It's 3" deep and was cheaper than most foam I could find. I cut it to size using an electric knife. It's definitely the easiest way to cut it. I've tried using a regular knife and scissors before and this way was so much easier. It just cut right through it. Once my foam was cut to size, I used some spray adhesive to hold it in place on the board. Then I covered the whole thing with batting and stapled that in place. Finally, I covered the batting with my fabric and stapled that in place. 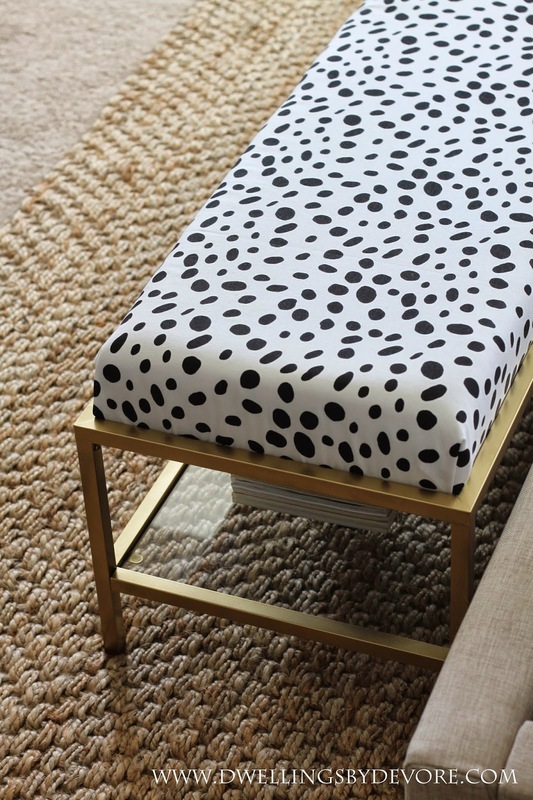 I chose to use the Dalmation spot fabric from Tonic Living. 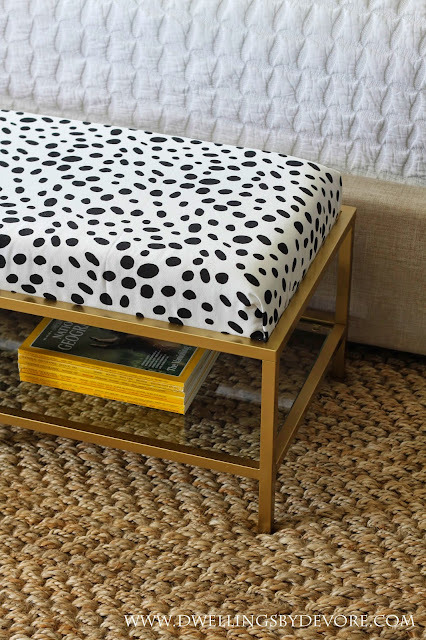 It's super affordable and it adds a nice graphic punch without competing with my leopard pillows. It also gives me the opportunity to easily change up my color scheme down the road. After I had the wood piece upholstered, I screwed it into place using the holes I drilled into the tabs at the beginning. I really like having the shelf below too. I wanted to add a small punch of color because the rest of the room is neutral. I found these vintage national geographic magazines at a thrift store and thought they would be a fun addition. SO perfect! what an awesome idea! This turned out so beautifully! Love it! It's the absolute perfect accent accessory for your bedroom. Just wouldn't be the same without it. Turned out gorgeous! You are just SO creative! I love this! That fabric is awesome! 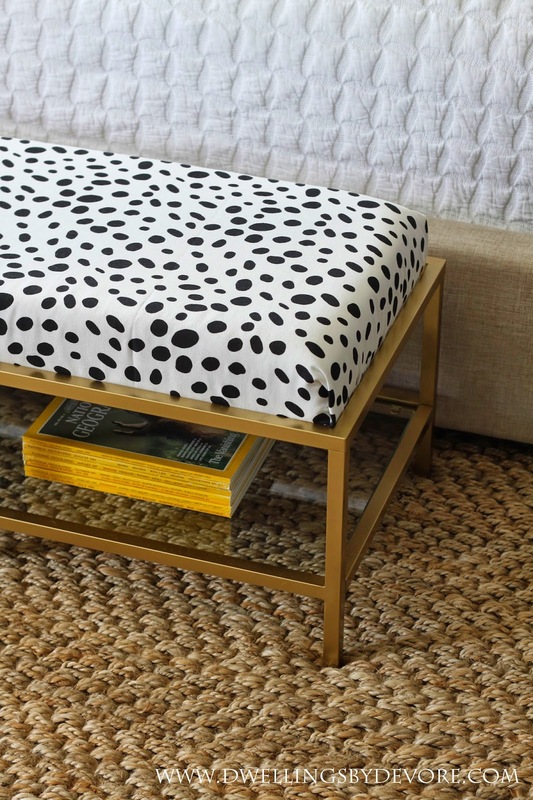 Now this is a great IKEA hack! And who knew Home Depot had foam cushions!!! So good!! love love love!! This rocks!! Bravo friend! 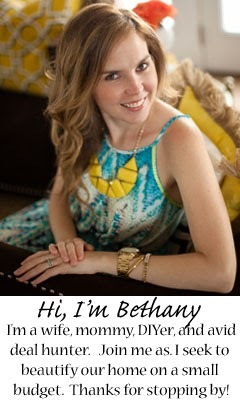 Thank you for sharing- I can see this happening in my home soon! I thought i already commented but i guess not! ZOMG, this is the most genius thing ever. I love the fabric you chose! I'd love to know how the bench is as far as sitting on it. Is it pretty sturdy? Came down here to say the same! I love Krys's Ikea hacks, they're so inspirational. Is yours safe to sit on in that extended width? So far it feels pretty sturdy. We don't use it a ton, just occasionally sit on it to put our shoes on and things like that. It feels pretty sturdy so far. We don't use it a ton except to occasionally put our shoes on and my toddler uses it as her own personal jungle gym. :) So far it's holding up great! I love, love, love this! How many yards of the fabric did you have to use? Thank you! I ordered two yards and still have a little bit leftover for other projects. Gorgeous room! Where are your leopard pillows from? Love this idea! What gold paint was used? Thank you! I used Rustoleum Gold Metallic Spray paint, it's my go to gold! Perfection on the DIY bench! Ok, so you're going to have to share a photo of your master bedroom window dressings. I'm hoping you have the same recessed, triple window area that we do in ours! I'm dying to know how someone else hung panels- inside the recess, outside on the main walls, etc. Thank you! Here's the link to the window treatments I did for our room: http://www.dwellingsbydevore.com/2014/10/greek-key-trimmed-curtains.html#.VQL7houJnzI We don't have the recessed windows, but that does sound a little tricky! oh no, that stinks! I hate it when they get rid of the good stuff :( It might be a long shot, but maybe you could check Craigslist for one?